The food production especially fruits and vegetables are surplus during the harvesting season, resulting in low selling price. Towards the end of the season the produce which was not sold goes uneaten or rots. Similarly, in alpine climate the food production is limited to few months in a year. Hence food preservation is important, among the various techniques available sun drying is one of common. Basically, drying involves the extraction of moisture from the product by heating and the passage of air mass around it to carry away the released vapor. Under ambient conditions, these processes continue until the vapor pressure of the moisture held in the product equals that held in the atmosphere. Thus, the rate of moisture released from the product to the environment and absorption from the environment are in equilibrium, and the crop moisture content at this condition is known as the equilibrium moisture content. Under ambient conditions, the drying process is slow, and in environments of high relative humidity, the equilibrium moisture content is insufficiently low for safe storage. The objective of a dryer is to supply the product with more heat than is available under ambient conditions, thereby increasing sufficiently the vapour pressure of the moisture held within the crop and decreasing significantly the relative humidity of the drying air and thereby increasing its moisture carrying capacity and ensuring sufficiently low equilibrium moisture content. In solar drying, solar-energy is used as either the sole source of the required heat or as a supplemental source. The air flow can be generated by either natural or forced-convection. The heating procedure could involve the passage of preheated air through the product or by directly exposing the product to solar radiation or a combination of both. Solar energy is an obvious energy source to use for drying many products, particularly food crops. Many crops are harvested in the summer months and are usually dried at temperatures below 700C - a temperature which can be readily attained by solar technology. The importance of food drying is likely to increase. Nepal suffers from serious food crisis. Out of 75 districts 41 districts have food shortage and experts from the United Nations warn that the situation is bound to deteriorate. Annually huge relief funds from international and government budget is allocated for food supply in the regions with supply deficit. Further the Government figures say food deficit has tripled in recent years with most of the increase since 2009 drought. A solar dryer uses the energy from the sun to dry food efficiently and hygienically with little capital investment. The dried food self life may be extended to a year or more depending on the process. In addition to foods for human consumption there are many other products we use that require drying. These include organic crops like timber and rubber and inorganic materials like paint. All of the above arguments emphasize the importance of drying in our lives. Drying is also an energy intensive process. The shortage of energy is an issue for many countries, particularly those in the developing world. Even where conventional energy is plentiful, there is pressure to reduce the amount of fossil fuels used. Concern over global warming is universal and this has focused our attention on energy intensive processes like drying where fossil fuels can often be replaced by renewable and non-polluting sources of energy. Drying involves the removal of the internal moisture to the surface and then to remove this moisture from the surface of the drying material. The sun has been used for drying as long as humans have inhabited the planet and laying a product out in the sun to remove its moisture is known sun drying. When sun drying, the temperature of the surrounding air remains at ambient temperature, while the temperature of the product is raised by the direct absorption of solar radiation. Although sun drying is still by far the most common method of drying it does have several inherent disadvantages. The unprotected crop can be damaged by rain, contaminated by dirt and animals and/or eaten by birds and insects. Since the temperatures attained during sun drying are usually lower than in a solar dryer, drying times are longer. This usually results in poorer final quality because of color discoloration caused by enzymic and non-enzymic browning, and often because of the formation of moulds.In a solar dryer however the temperature of the air surrounding the product is raised above the ambient air temperature. Depending on the type of solar dryer, the temperature of the product may also be raised by direct absorption of solar radiation. The temperatures in a solar dryer are higher than in sun drying and this reduces the drying time and usually improves the final product quality. Crop losses and spoilage from rain and animals are prevented because the crop is protected within the solar dryer. 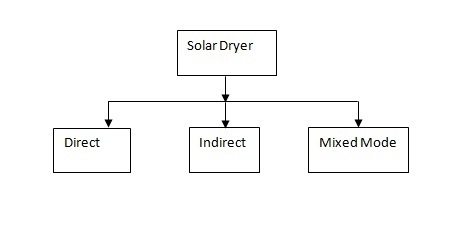 There are many different types of solar dryer but they can all be conveniently classified into three distinct categories depending on the mode of heat transfer from the sun to the product.